Chan Lowe points out what we’ve been seeing on Facebook, which is that what people were warned about six months ago or more is happening now. The Tax Cuts and Jobs Act was passed in 2017 and so this is the first year it impacts your taxes. There was always a suspicion — big surprise — that it was better for business than for individuals, but the specific matter of withholding was only a suspicion until this past August, when the GAO suggested that two out of ten Americans were not having enough withheld and would have to pony up at tax time. My father taught us that your goal should be as small a refund as possible, since it’s basically an interest-free loan to the government, but there are plenty of people who treat withholding as a Christmas Club, that old program banks and credit unions run where you put a little in each week so you can cash out at Christmas and buy presents. Well, it may be a blue Christmas this April, and not just for the MAGA crowd. However, we’re all looking at longer term losses than that, and Pat Bagley has been keeping his eye on the impact of putting the foxes in charge of the chicken coop, his home state of Utah being a prime target for those who feel land not exploited is land wasted. 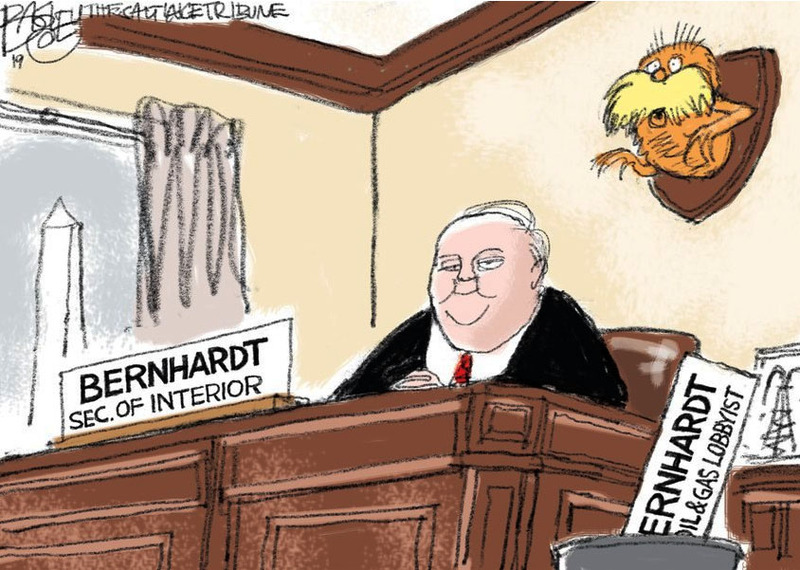 The latest outrage is the nomination of David Bernhardt, an oil lobbyist, to head the Department of the Interior. This is a bit like “white privilege” in that you have to stop and kind of step outside of the dominant culture to understand how it works. But what people like John Muir and John Burroughs and, thank God, Theodore Roosevelt saw at the turn of the 20th Century was the fatal disconnect between the Manifest Destiny crowd and those with a less Puritanical view of the land. The villains were the same people who sincerely couldn’t understand that the hunter/gatherers of the Northern Plains would be unable to pursue their lifestyle on small reservations, and, further, felt it a benefit to be converted from nomadic buffalo hunters to European-style farmers. When they saw open prairie, they saw opportunity, if only it could be turned to wheat and oat production. When they saw forests, they saw timber. And even if they appreciated the beauty of Yellowstone, they thought it would be better with train service, not recognizing the impact of noise and smoke on the pristine atmosphere of the place. That 19th Century viewpoint is alive and well and back in the drivers’ seat, such that they look at Utah’s open areas and feel that, since cattle are willing to graze next to oil rigs, there’s no practical reason to leave that land vacant and unproductive. Blackfooted ferrets, sage grouse and Indians all being in the class of colorful throwbacks that need to adjust and get with the times or get out of the way of progress. As it is, we’re lucky there’s any of that open land to exploit. Lovers of the Lorax might want to remember that Roosevelt only became president by accident, that the ruthless exploiters of land and of people only made him vice-president in order to shut him up and make him irrelevant. 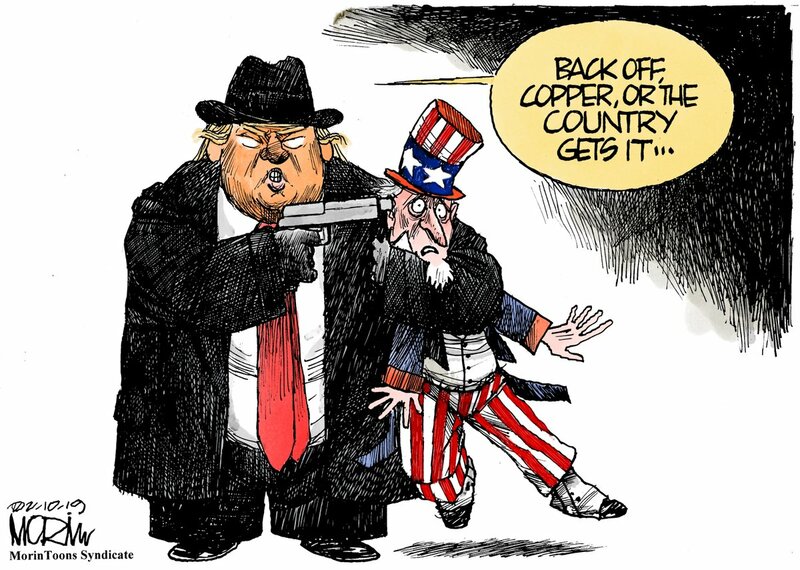 If you want to reverse what’s happening, I don’t think hoping for help from Leon Czolgosz is going to replace getting out there and pounding the pavement and putting your own people in power. Though you need to be careful who you support: While I know that Roosevelt praised the 10th Cavalry for their role in the assault on San Juan Hill, and I’m aware of his dinner with Booker T. Washington, I haven’t examined his Harvard yearbooks. A lot of people have noted that, while Trump called for an end to investigations in his SOTU speech, so did Richard Nixon, only a few months prior to resigning. But Nixon’s criminal conduct was largely limited to gaining and maintaining political power, while Trump’s has a much greater element of personal enrichment and exploitation of the office. Granted, Nixon prolonged the war for political leverage, but he also catered to the crowd by instituting the Environmental Protection Agency, and whatever he may have raked off from Bebe Rebozo and Robert Abplanalp was — for better or worse — not much more than other presidents have received from their wealthy fans. 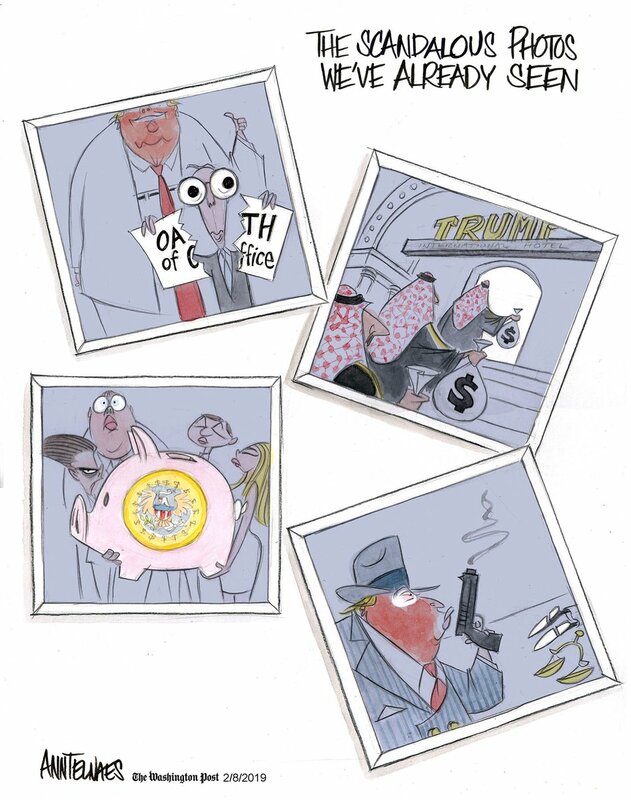 Morin captures the difference in tone, while Telnaes captures the difference in take. Trump’s hotel in DC only opened two months before he was elected, so we can’t go back and see where foreign dignitaries stayed in the years he was not in office. But the Southern District of New York is apparently parsing some emails that suggest Ivanka was chided for Inaugural Ball rates that were not competitive with other venues, while it seems possible that illegal foreign donations to the inaugural committee were being laundered and accepted. We’ll see how that comes out, but threatening the one of his kids he actually seems to care about is an interesting move. 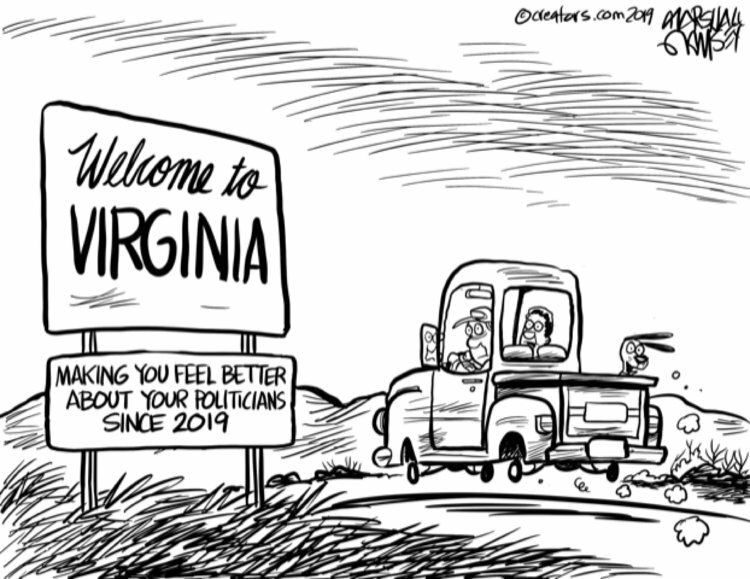 Marshall Ramsey gets a laff for this one, but, as he suggests, Virginia is just the place where they got caught. At the height of the Civil Rights Movement, it seemed the bad guys all lived in the South, only we didn’t realize that it included South Boston until people like Phil Ochs and Stokely Carmichael and Huey Newton pointed it out. And if you laughed at the racist, sexist screw-offs in “Animal House” in 1978, don’t hold your head so high. Entitled frat boys of that era are exactly who we’re talking about now. Which remains an excellent question. Now that the Gov and the AG are out of the way, there’s only one person to stop the GOP House Speaker from taking the office of Governor — and that’s Lt Gov Fairfax. And so, suddenly, two women come forward to claim sexual assault. And of course we’re to totally believe the victims. It was interesting to read what Mark Twain said about TR meeting with Booker T. Washington. He was near apoplectic, and he said that Roosevelt was so far inferior to Washington in every way that he was disappointed in Washington for accepting the invitation. So you can only run for office if you’ve never done anything stupid in college or grad school. Oh wait, it doesn’t count if you’re Republican.